One day as I was preparing the marinade for my Biryani, I got thinking and decided to try out a Korma which uses the same masalas as the Biryani. I can’t claim this dish as mine alone because Tarique remembered his mother making Hara Mutton Korma too, though he did not remember the ingredients. The taste however, he said, is pretty close to what he remembered eating as a child. The flavour of Hara Mutton Korma is subtle, of the herbs Coriander and MInt, and spices Cardamom, Mace, Cinnamon, Cloves and Nutmeg. Best eaten with Zeera Rice, but you can easily pair this with Paratha, Nan or Rumali Roti as well. 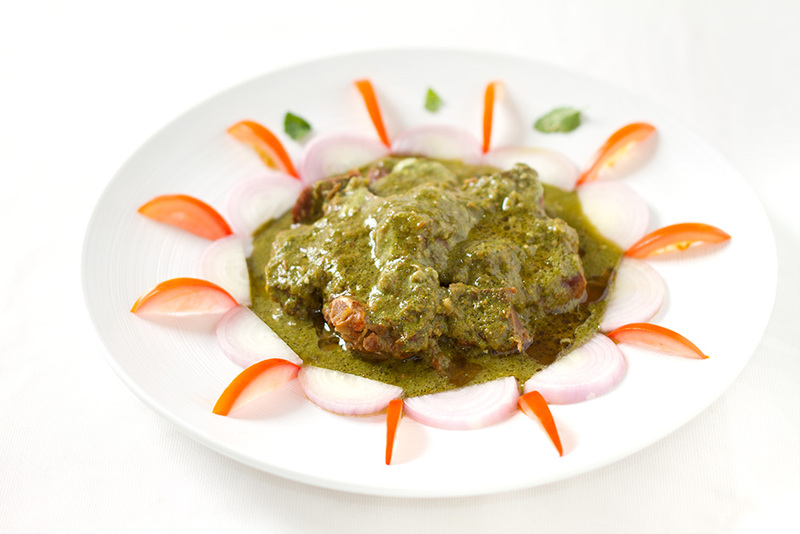 Make a paste of Coriander, Mint and Green chillies (4-5) and keep aside -this is your green masala. In a pressure pan heat ghee, add cardamom, cinnamon, black pepper, cumin, black cumin, cloves and mace and stir for a few minutes. Add to it finely chopped onions, crushed garlic, grated ginger and the renaming 2 green chillies. Fry till the onions get translucent. Add Mutton and keep frying till all the water gets completely absorbed and mutton browns , and the ghee starts to surface on top. Add the yoghurt/curd and continue frying till the ghee comes to the surfaces again. Add 1 cup of water, salt and close the lid of pressure pan, cook for about 20 minutes on low heat after the first whistle. After the pressure drops, check the mutton for salt, add more if needed and tip in the green masala (coriander, mint, green chili paste) and garam masala. Keep on gas on low heat for about 5 minutes, switch off and serve hot with zeera rice. The word “korma” is derived from Urdu ḳormā or ḳormah, meaning “braise”, derived in turn from Turkish kavurma, literally meaning “cooked meat”.Korma (قورمه in Persian) has its roots in the Mughlai cuisine of modern-day India and Pakistan. It is a characteristic Moghul dish which can be traced back to the 16th century and to the Mughal incursions into present-day Northern India, Pakistan and Bangladesh. Classically, a korma is defined as a dish where meat or vegetables are braised with water, stock, and yogurt or cream added. The technique covers many different styles of korma. Turned out really well, thanks Swati. Hi Swati, Interesting recipe, but you’ve forgotten to mention how much mutton this recipe is for… I’m assuming 1 kg? Thanks for pointing out, Manish. Yes, it is 1kg.